The dome shape massif of Vitosha Mountain is located next to the capital of Bulgaria – Sofia. Actually the south parts of the city are lying at the outskirts of the mountain. Its highest point – Mount Cherni Vruh (The Black Peak) is 2290 meters high and the centre of Sofia is at about 550 meters above sea level. This location determines the importance of the mountain as a place for outdoor activities and recreation. 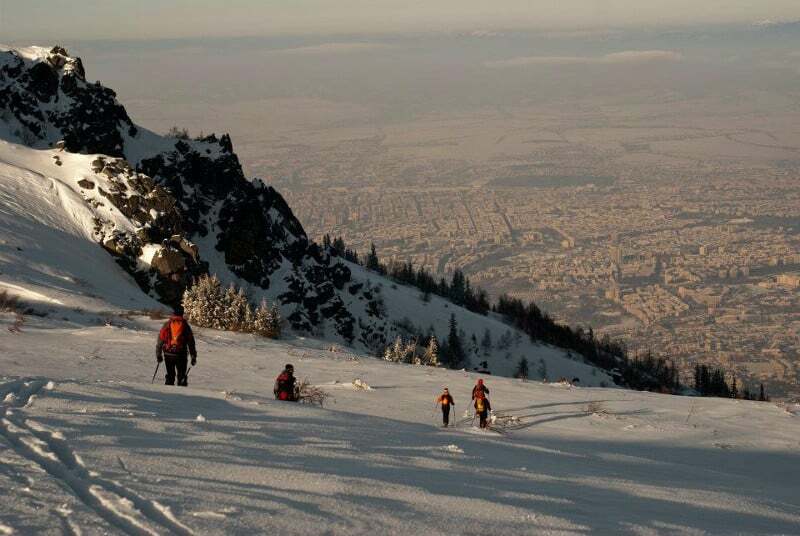 Sofia has a population of about 1,5 million people and for many of them this mountain is the best place to practice their favourite activities. 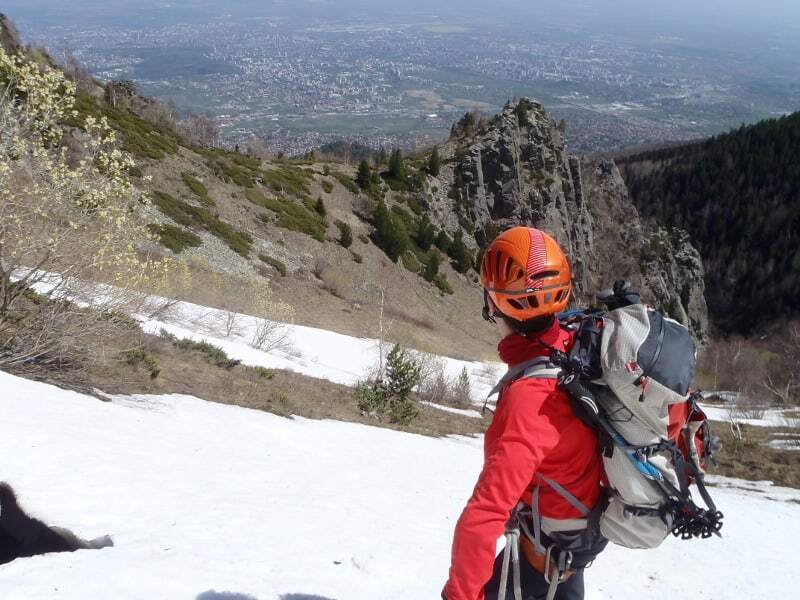 On the slopes of Vitosha there is possibilities for hiking, mountain biking, climbing, skiing and ski touring, snowshoeing, paragliding, caving. Many people simply go up the mountain to see the great panoramas of the capital and have a picnic in the nature. There is more than a dozen huts in the mountain, also some small hotels and restaurants, located mainly around the main starting points. The ski infrastructure is located near Aleko Hut. In 2013 most of lifts are old and some are not functioning for various reasons, including the contradiction between developing the ski area and protecting the nature on Vitosha. Vitosha is covered by snow from December to April and winter activities are possible during this period in the highest parts of the mountain. The top parts of Vitosha are notorious with the bad weather. 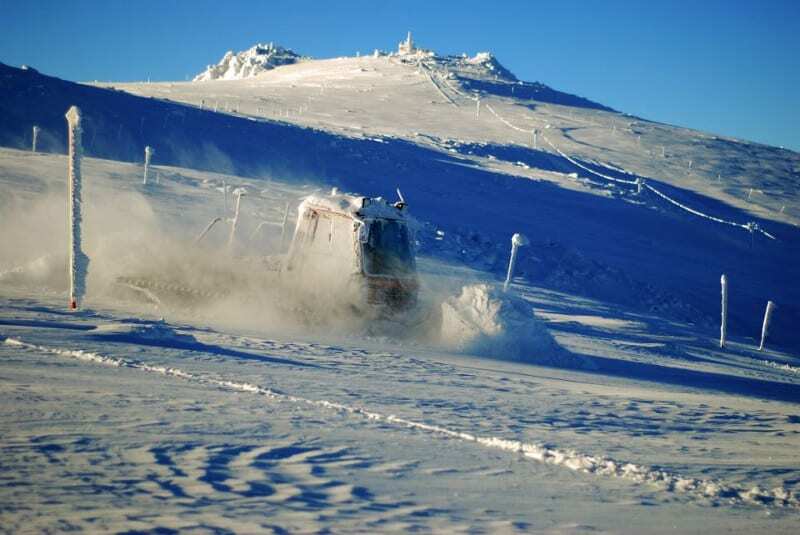 Mount Cherni Vruh is considered as one of the windiest places in the mountains of Bulgaria, so proper equipment and preparation are required in every season. The area of Kominite is a popular place for sport climbing with about 70 bolted routes, also some traditional ones. 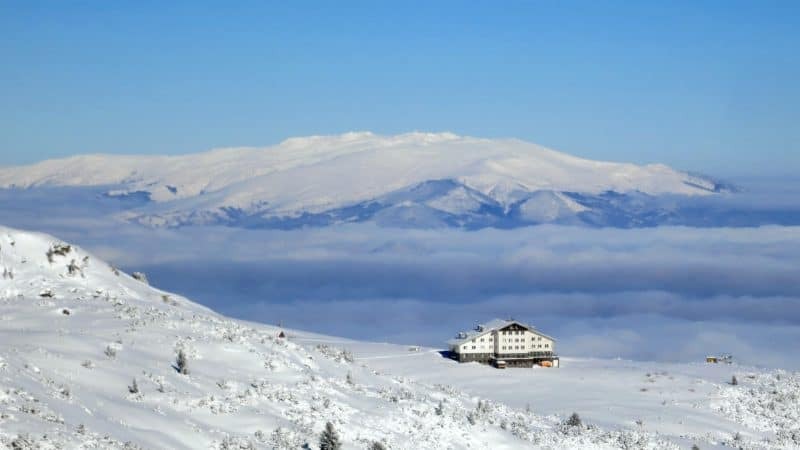 One can get there for about 25 minutes on foot from the middle station of the Dragalevtsi-Aleko chair lift – Bay Krustyo station, which is also accessible by the road to Aleko Hut. Other climbing areas are Reznyovete and Boyana Waterfall (for ice climbing in winter). The area around Aleko, especially the trails under the chair lift are popular for downhill MTB. In general Vitosha offers a number of routes for cross country and downhill biking – from beginners to expert. The area of Aleko Hut, located at 1810 meters above sea, which is connected by a cobbled road to Dragalevtsi district, a suburb of Sofia. The cabin lift from Simeonovo (another suburb of Sofia) also ends there, so the chair lift from Dragalevtsi. Most people who approach the summit – Cherni Vruh – start from this point. It takes about 1,5 hours to reach the top. There is a meteo station there and a small tea house – food and drinks are offered during weekends and the whole high season, but no accommodation. There is many other routes that descend to the villages on the north-east side of the mountain or cross the high plateau of Torfeno Branishte Reserve to the Zlatnite Mostove area. Aleko is aslo a starting point of the Bulgarian part of E4 international hiking route that crosses Vitosha, Verila, Rila, Pirin and Slavyanka mountains in Bulgaria. The area of Zlatnite Mostove – also connected by an asphalt road to Sofia (Boyana distr.) There is numerous routes starting from here – to the top of the mountain, to Aleko Hut, Boyana Waterfall and Boyana Lake or the other villages at the foot of the mountain. Zlatnite Mostove is also accessible from Knyazevo and Boyana districts of Sofia for about 2 hours on foot. By the roads to Aleko or Zlatnite Mostove. Possible by taxi or bus. Buses are not regular, there is a bus to Zlatnie Mostove in the high season running from the Natonal Stadium, also a bus to Aleko from Hladilnika (only on weekends). Hiking from the outskirts of Sofia – the villages of Knyazevo, Boyana, Dragalevtsi, Simeonovo, Bistrica and Zeleznica, all accessible by public transport from the centre of Sofia. By the lifts – make sure they are operating at the time you want to visit. Vitosha is the 4-th highest mountain in Bulgaria, after Rila Mountains (Mount Musala, 2925 m.), Pirin Mountains (Mount Vihren, 2914 m.) and Balkan Mountains (Mount Botev, 2376 m). 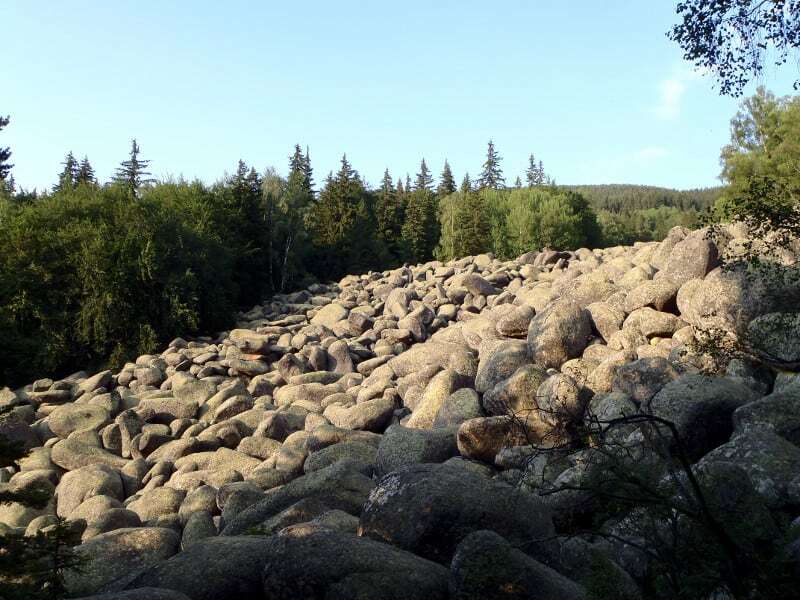 Vitosha is famous with the so called Vitosha stone rivers – rock landforms, ribbon of huge round boulders that run down the mountainside. They are result of the erosion of particular rock varieties. The most famous are the stone rivers near Zlatnite Mostove above Knyazevo district. Vitosha Nature Park is the oldest park on the Balkans, established in 1934 (it was a national park first). It preserves the rich flora and fauna of the mountain and is the most visited protected area in Bulgaria. The official start of the organized mountain tourism in Bulgaria was with a climb to the top of Vitosha in 1895 when about 300 people reached the summit on foot. At the south slopes of Vitosha, at a height of 2246 m, springs one of the big rivers in Bulgaria – Struma River. 415 km further Struma reaches the Mediterranean Sea in Greece. The longest cave in Bulgaria – Duhlata Cave, 17 600 m. long, 53 meters deep, is located on the south side of Vitosha. There is a few thermal springs around Vitosha – near the villages of Rudartsi, Knyazevo, Zheleznica and Pancharevo. It is possible to see 236 different bird species around the mountain during the seasons. There is only one small asphalt road that lays on the migration paths of the animals between Vitosha and Rila Mountains, so one can still meet brown bears on Vitosha, also dears, wild boars, wolfs. Unfortunately the tourist stream disturbs these animals and now only a small number of them inhabits the most remote and quiet parts of the mountain.